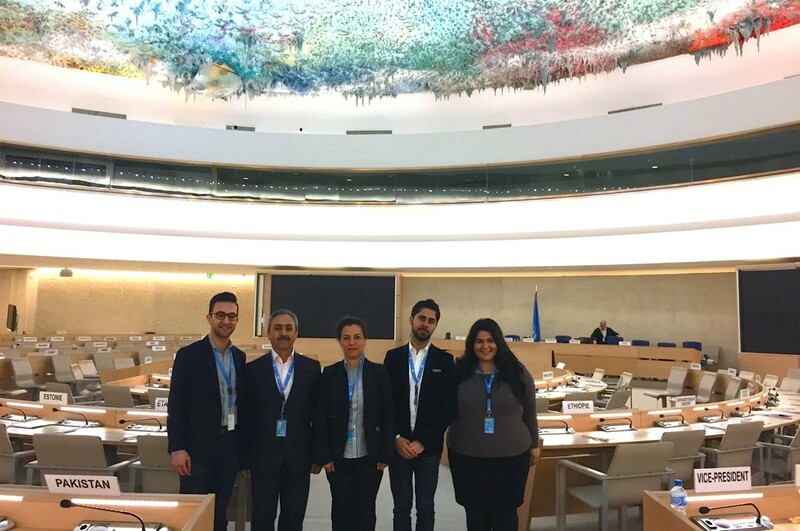 AUA Americas participated at the 28th Session of the Human Rights Council at the United Nations Headquarters in Geneva, Switzerland from March 17 – 25, 2015. 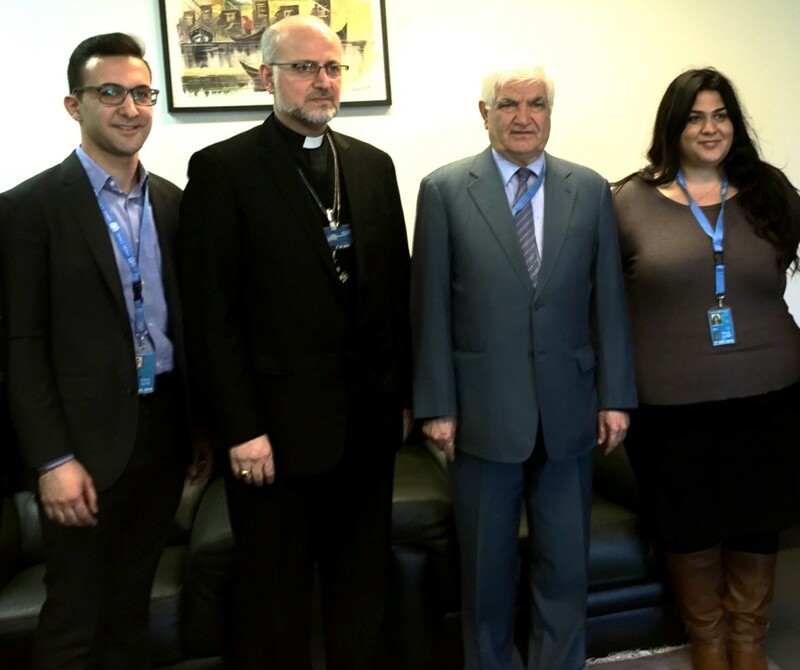 Alen Mirza and Rosemary Youhana, together in coordination with Assyrian civil society leaders from the Middle East and Europe, traveled to Geneva for ten days to address human rights abuses facing Assyrians in Iraq and Syria. AUA Americas facilitated the participation of Mr. Mikhael Benjamin, Vice-President of the Nineveh Center for Research and Development in Iraq, Ms. Susan Khoshabah, former member of the Kurdistan Region Parliament, Mr. Usama Edward, founder and Executive Director of the Assyrian Human Rights Network, and Mr. Georges Chachan of the Assyrian Democratic Organization. 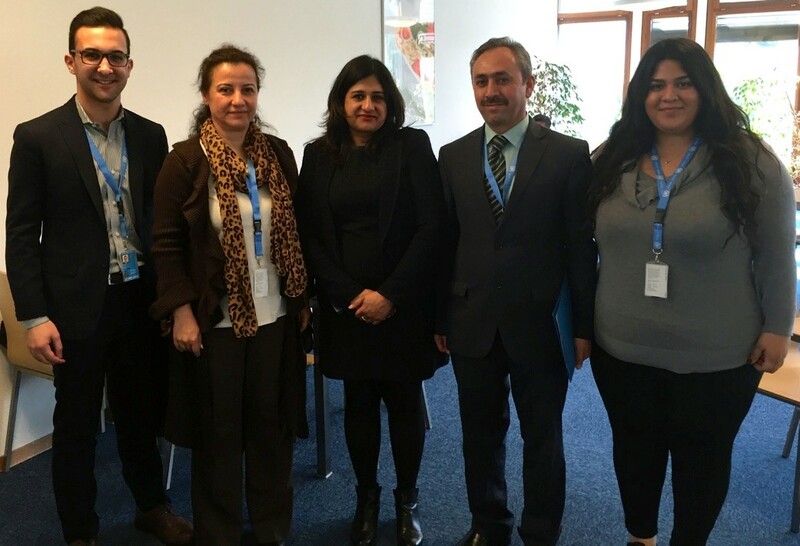 In Geneva, AUA Americas also coordinated its advocacy efforts with members of the Assyrian Aid Society of Iraq. A UN report released at the Human Rights Council documented the forced displacement of over 200,000 Assyrian Christians from the Nineveh Plain by the so-called Islamic State. The report alleged that the atrocities may amount to “crimes against humanity” and urged the Government of Iraq to allow the International Criminal Court to investigate these and other human rights violations. AUA Americas discussed the report with the lead author, Ms. Suki Nagra, the First Secretary of the U.S.’s Mission to the UN in Geneva, Ms. Kim D’Auria-Vazira, and with the Ambassador of Iraq to the UN in Geneva, His Excellency Mr. Mohammad Sabir Ismail, among others. Members of the Human Rights Council also condemned the kidnapping of the over 200 Assyrian Christians from the Khabur region in Syria by Islamic State militants. 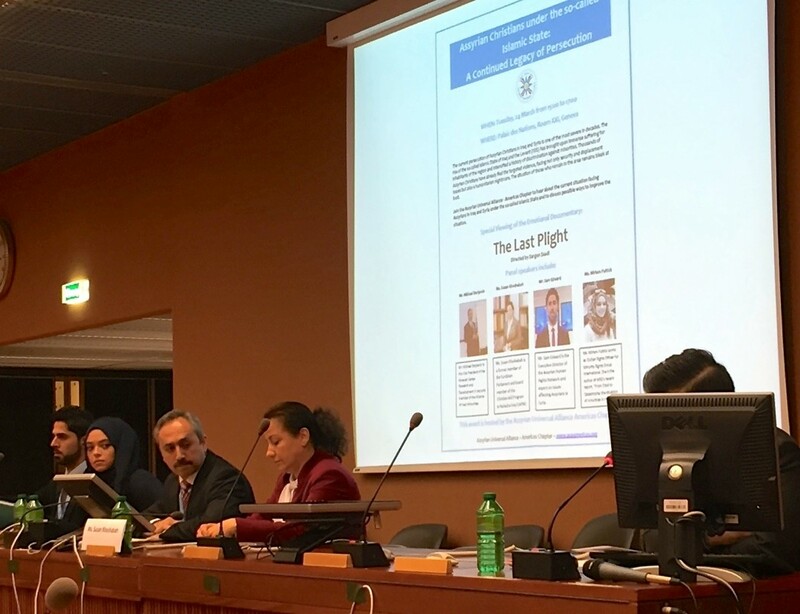 AUA Americas raised the issue with Ms. Elodie Cantier-Astiride, Chief of Investigations for the UN’s Commission of Inquiry on Syria, which monitors human rights violations in Syria and presents its reports to the Human Rights Council. During the 28th session, AUA Americas delivered five oral statements, calling for an end to discrimination against Assyrians in Iraq and Syria, justice for victims of IS-related human rights violations, and the establishment of a safe zone for the return of those displaced in the Nineveh Plain. Recordings of these statements can be found on the UN website. To increase the level of dialogue during this session on the situation faced by Assyrians, AUA Americas organized an informative lecture titled, “Assyrian Christians under the so-called Islamic State: A Continued Legacy of Persecution.” The panelists for this event included Mr. Mikhael Benjamin, Ms. Susan Khoshabah, Mr. Usama Edward, and Ms. Miriam Puttick of Minority Rights Group International (MRG). The publication of this press release was delayed in respect for the passing of His Holiness Mar Dinkha IV, Catholicos-Patriarch of the Assyrian Church of the East. Participants present the legacy of persecution facing Assyrians in Iraq and Syria at a briefing inside the UN Headquarters. Participants prepare to leave on the last day of the Human Rights Council session.